Are you a paintball fanatic? It is a wonderful game where the players try to shoot each other or the opposing team members, using guns which fire paint rather than bullets. Who could have possibly thought that? Day by day this game is becoming more popular in the world because it is a great stress buster and helps to develop management skills, helps you learn teamwork and acquire team spirit. It is also a game which requires some amount of active movement, thereby aids to maintain your physical fitness. SHOW ME THE TOP 8 PAINTBALL PISTOLS NOW! Now if you’ve always been playing paintball with a gun that has been rented or borrowed, and have decided that it is time to get your own best paintball pistol, then you are in the right place, referring to the most helpful guide. You might be pretty confused as from where to start, which gun to buy and from where. Before you begin searching on your own you need to know some basic pointers and keep them in mind before making a decision. This guide will provide you with the necessary points that you need to know before getting yourself the best paintball pistol. The first section will discuss different types of paintball guns that are produced, so that it gets easy for you to select and shortlist a type according to your requirements. The second section will deal with factors to keep in mind before purchasing a paintball pistol. The last section will provide a detailed review of some of the most popular paintball guns available online. Then you can always refer to more gun reviews and check out gun manufacturer’s websites to learn more about gun specifications. The very first category we have picked up is the most basic type of paintball gun. As the name suggests, this gun comes with a pump that needs to be pulled forward and backward to help you set the next paintball after making a shot. This pump feature prepares the next shot that you will take. They usually have a simple design and are very durable, plus reliable. In the past few decades when paintball started gaining popularity, these guns were the classic ones. The older generation people still prefer to play with this type of gun. The event where this type of gun is used the most is the Stock-class paintball event. The second type also comes under the basic paintball gun models. To make a shot every time, you need to pull the trigger. These are usually available in the market because of their basic design and simple functioning. Nowadays these are available in both manual and electro pneumatic models. Most of the guns that are used and rented in the entry level paintball games are semi-automatics. 3 – Shot burst paintball gun is also known as 3- round burst gun and is very much advanced as compared to pump paintball guns and semi-automatic ones. This gun has got that name because you can shoot three times continuously by just pressing the trigger once. There are electro pneumatic paintball pistols as these types of guns are equipped with multi firing modes. You may choose to switch the firing mode between the semi-automatic and 3-shot burst. These are not that preferred in the field as many players want to use a mode which is between the semi-automatic firing mode and 3-shot burst assisted firing mode. So many professional or skilled players need to keep switching while playing. This is the reason why this type is not suitable for beginners because they are not that skilled to keep switching to two different modes of firing in the same gun. This type is considered one of the best paintball pistols type for quick firing in the paintball field. In ramping paintball gun all you need to do is press the trigger continuously, and the firing rate will keep on increasing gradually with the assistance of circuit board places in the gun. When you pull the trigger of this gun 3 times it will fire exactly 3 times and if you press it 4 times then instantly it will release 4 shots. But when you continuously keep a hold on the trigger then the firing rate of the gun gradually keeps increasing. After some amount of time the firing rate reaches up to 20 rounds per second. This is what makes this gun the best paintball pistol. These ramping paintball guns are best to use for fast shooting and enjoyed by beginners as well as professionals. But they might not be allowed in certain tournaments because they might not be safe to use after a point, when the shooting rate reaches up to 20 rounds per second. Therefore it can cause a serious injury or harm your opposing team member. Fully-automatic paintball pistols have similar features to those of ramping paintball guns. This one also helps for quick firing in the field but he difference is that you may not need to pull the trigger many times. You can fire until you hold and pull the trigger. As soon as you depress the trigger the firing will automatically stop until and unless you start to pull the trigger again. These guns do have a defined rate of firing that means that you cannot control the shots fired per second. All types of models available in these guns by various manufacturers have a variation in the firing rates. This feature will be mentioned in the product’s description. The higher the rate of firing is the more expensive that gun is. If you are tight on your budget, you can select accordingly. As these pistols also have a high firing rate, these are also banned from use in particular tournaments. You can use them in private or corporate paintball tournaments and competitions. Do note that this is not a very secure paintball gun because it may injure or really harm another player’s body if not used carefully. You have to be extra careful with this gun. You must make sure to keep this point in mind before making a purchase. This term, in the world of paintball pistols, has been used in a misguided way a lot many times and by many people. It is not specifically a totally different type of paintball pistol. Machine Gun paintball guns refer to a gun that has the ability to fire quick, covering many rounds in a second. This means that ramping guns, as well as full automatic paintball guns, can also come under this category and can be used as machine guns in the field. You can even use semi-automatic guns as machine guns if they come with a firing rate which is equal to or near to ramping guns. Like ramping guns and fully-automatic paintball guns, these ones are also banned from certain tournaments because at the same rate, they too can harm the other player. If safety is not the main concern for you then you may purchase this gun and use it for private as well as corporate tournaments, where this type of paintball pistol is not prohibited. There are still a variety of other types of paintball guns that are available in the market with different features like blowgun paintball pistol, angel paintball guns and many other sundry designs. Selection of any best paintball pistol out of these 6 broad types totally depends on the style you want to use, the purpose of your use and the personality that you have. Certain people can handle certain types of models easily and the purpose becomes important because if you play significant tournaments then you should not probably invest in fully-automatic or ramping paintball gun types. Each person has their own budget and choice which helps to differentiate the selection of purchasing. The next section will discuss some of the most important factors that you need to consider before buying the best paintball pistols. A full and the most basic set up for paintball can cost anywhere from $70 to $120, plus excluding plastic pumps. A lot many stores rent out complete sets of equipment which includes gun, mask, hopper and tank for like $10 or $20 a day. If you are not that kind of a person who regularly needs to play paintball and only require the equipment once or twice a year, then it could take at least six more years to pay for the price of the equipment as opposed to renting, and by then, your equipment would become old. If you plan on using the whole equipment at least a few times in a year, then it may be worth it to spend in a low- budget equipment of your own. If you are skilled player or a novice who plans on playing paintball in the field at least twice a month, then do not consider buying a cheap gun and other necessary equipments. Cheap guns are not that good to begin with because they are neither easily upgradeable nor reliable. The Brass Eagle Striker is one such paintball pistol which is not that expensive and works pretty fine. But do note that it is not very smooth, fast or accurate as a gun. It is not the best gun for those who are already professional players or for those you are beginners and want to learn more, practice on a regular basis. Striker is the best for those people who play for entertainment, like twice or thrice in the season. If you want to compete in tournaments and want to grow as a player then do remember that to give a tough competition you need a good gun which can work fine. For that you will have to shell out some more money. Low-Range or a Medium-Range? Which one do you Require? If you are a beginner who is planning to continue playing a lot of paintball then you need to decide whether you want to start with a lower-end or a medium-range gun. There are a lot many guns available in the market as well as online which cost about $60 to $150 and work fine for many new users. Some of the low-end models available are durable, reliable, upgradeable, and will deliver well for the years to come. These types of guns will run on CO2. On the other hand, if you want to buy a gun which costs a little more and works extremely well in terms of accuracy, reliability, then you will need to increase your budget a little more. The medium-range guns can cost anywhere from $200 to $300 and are designed to handle all the wear and tear of a 24 hour scenario game on a speedball field. You can find the best paintball pistols if you are willing to spend double the money, and within that range you can get the best of deals. What can Possibly Happen if Your gun Breaks? Well paintball guns can actually break after a certain amount of time or after extensive wear and tear. So before you purchase a gun, make sure to check how much will be the total cost required to repair that gun. A gun that costs $30 might cost $18 just to replace the air hose of the gun. Rather than spending on expensive new parts provided by the same manufacturer, you can look for those guns which use parts that are made by many companies and not just manufacturer. Some professional guns are pretty delicate and are designed in a way that even the most basic maintenance requires to be done by a professional or a skilled gun hobbyist. Before choosing a gun for yourself just make sure to read the manufacturer’s details learn how hard or easy it is to repair you gun if it breaks. Check whether or not you can fix it yourself if it breaksdown. Do you want a Mechanical or an Electronic Marker? Mechanical markers are the ones which require no electricity and on the other hand, electronic markers run with batteries and circuit boards. Mechanical markers come with a perk that they are very reliable but the cons are that they are slower and louder. Electronic markers come in two different types; electro-mechanical and electro-pneumatic. Electro-mechanical markers are similar to mechanical markers just that they have an electronic trigger frame that fires the marker, usually in 3-round burst or fully-automatic modes. Electro-pneumatic markers shoot by triggering a solenoid valve that permits are passage to help shoot the ball. These are better because they can fire continuously and are quieter than mechanical markers. But note that they cost more and are much difficult to fix if anything happens. The kind of paintball pistol you buy also depends on the kind of paintball you want to play. If you want to play on scenario games or woodsball then you may need a gun that is modeled to be carried like a rifle with the feature to attach a stock. The size is not to worry about as if the gun feels comfortable to use and is reliable. Do not prefer using shiny colors for woodsball play. If you want to play speedball then smaller the size the better it is. You must search for a paintball pistol that is compact, is easy to clutch up against bunkers, and fits close to your body, plus a gun that shoots fast. In speedball you can for sure buy bright and shiny colored ones if you prefer. Some people want to play both woodsball and speedball, so for them it is recommended that they buy a smaller gun that can be used for speedball and then a stock can be attached to it when needed to play in the woods. What Other Extra Equipment is Required? It is recommended that before purchasing you best paintball pistol you do consider beforehand that what other equipments you will require. Do not buy hastily and spend all your money only on the gun, forgetting about other types of equipments. For example, a super quick electro-pneumatic gun will not do you much good if you only have a gravity fed hopper. To learn if your gun will need you to buy a compressed air tank and if your gun demands a basic upgrade, like a new regulator before it works acceptably. Consider if you will be fine playing the whole day in the paintball field with a decked out gun and a poor fitting $10 mask. Thus by evaluating the total cost of all the necessary equipment before you purchase you gun, you will have a clear idea as to what type of setup you can afford within your constructed budget. Are you Okay With Buying Used Equipment? Talking about buying necessary equipments it becomes significant to consider if you are fine with buying a second-hand gear. Well you can actually save a lot of money if you think about buying a used gear. Before thinking about it please make sure to consider that second-hand equipments may require adjustments, may show signs of wear and may not be in the exact neat condition you has in mind. If you are sure about this then you may check eBay-style auction sales. Local classifieds, some local stores which sell paintball equipments and guns might also offer second-hand gear in a reasonable price. Make sure you do keep all these factors in mind before purchasing the best paintball pistols of your own choice. Make a budget, select what kind of models provide the features that you need and then look for necessary equipments according to your requirements. Now the guide will list some of the most popular paintball pistols that are available online. 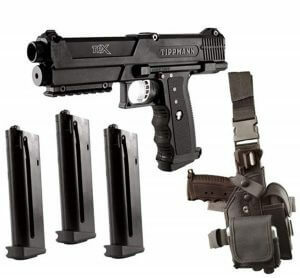 This paintball pistol by Tippmann is a renowned pistol in the world of paintball guns and games. Tippmann is a very popular manufacturer of such pistols. This particular model has been designed to look like a military firearm. It is a compact, smooth and classy design which helps to handle fine in a combat because of its firm grip. The trigger of the gun is made of metal. It delivers a natural performance and is easy to handle. 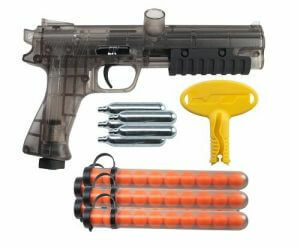 Therefore it is considered to be the best paintball pistol for both beginners and skilled players. It fits in the semi-automatic type of various paintball guns. It can be operated by pressing the trigger, then the open bolt fires a shot, and then the pistol’s blow-forward mechanism helps to reduce the coil. It comes with a spring-loaded Tru-feed magazine, which helps to instantly push the paintball right into the pistol’s chamber. When you pull the trigger after the marker inserts CO2 cartridges then it will puncture. Please note that when you press the trigger for the very first time, it will not fire immediately. On the second press the pistol will shoot the first ball. It comes with various other features; like this model comes with an under-barrel CO2 air system and a Picatinny rail that aids in fixing attachments. It is a magazine-fed maker and a semi-automatic pistol that gives the fells that you are actually holding a real pistol. It is lightweight (approximately 2 pounds), has a close-packed design which is great for hitting single targets and for tactical backup. With a creative design it is also equipped with a two 7 round Tru feed stack magazines, low tension system springs and a fast release mechanism. It has a caliber of 0.68 and has 8 bullets per second feed rate, plus an external velocity adjuster. The mechanism is as such that it helps to minimize the kicks and maximize air efficiency. It has a 12-gram air system, an ergonomic grip and a regular threaded A5/X7 barrel. 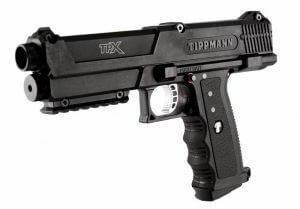 This is yet another best paintball pistol by Tippmann. The cardinal quality of their guns makes them significant producers in this market. They usually come with different designs and patters for their gun. The earlier mentioned product was designed like a military firearm and this one is designed to look and feel like the martial styled firearm. The marker of this pistol is highly dependable as it is high on accuracy. At the rear of the receiver of the gun, adjacent to it, a velocity adjuster is located. You will be able to locate a circular notch that allows one to place a remote adapter which helps to maximize the gun’s efficiency. Like the earlier model by Tippmann, this one too is designed with an under-barrel CO2 air system plus a Picatinny rail just for fixing attachments. It is the 2nd generation creation and the Tipmann squad have made advancements in sundry aspects, remodeling the features that its earlier models had and also transformed the overall design. It is also a magazine fed and a semi-automatic marker that makes you feel like you are holding a real handgun or a pistol. It has a very classy appeal as compared to other paintball guns available in the market. It is one of the bets paintball pistols because it offers a compact and flimsy design, which facilitates solo targets. It basically focuses on providing maximum effectiveness at a reasonable price. In the earlier parts of this guide, we had mentioned that before buying you should be well aware of the gun’s maintenance and repair features. This particular model has been designed in a way that you can easily gain access to the internal mechanism of the gun and therefore easily engage in its maintenance. It is built of insubstantial and high jolt polymer. This means that the unit is very much reliable, ideal and light for a person who wants a coherent sidearm rather than moving with an unwieldy pistol. The way you can operate this gun is very simple as both, beginners and professional players state that it is very easy and extremely comfortable to play or compete with. It has a semi-automatic attribute and that is why fires from its open bolt. This one has a blow-forward mechanism to minimize pistol’s recoil. With the spring of the gun being fully loaded, it will keep on pushing the paintball into their pistols compartment. Remember that it will fire the first ball not in the first but in the second push of the trigger. It is equipped with two spring-loaded Tru-feed magazines that can hold up to 7 rounds each. It was produced to outplay the mis-feeding problem that was a part of the floundered magazine. 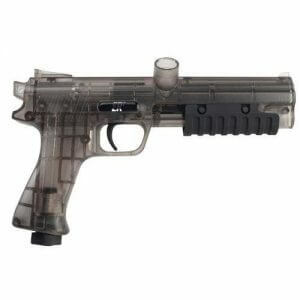 This paintball pistol is from JT Toxins, another renowned brand in this industry. This model has funky design, cool specifications and delivers high efficiency. 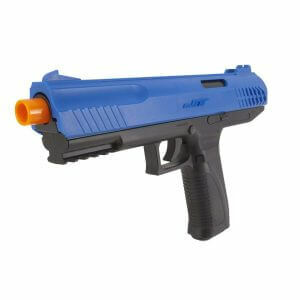 It is the best paintball pistol you can buy for your adventure game requirements. It comes equipped with five 12grams CO2 tubes that are each filled with 10 paintballs each. That makes a total of 50 rounds for shooting just with the whole set. Most of the paintball guns available do not come with so much balls and tubes. So you have to buy the paintball fillers and paint tubes separately after buying the gun. One best feature of this gun is that you will get a “pump” which includes the brand name. This pump is the interesting features of this whole set which makes this pistol is worth investing your money in. Given that there are too many extra features provided in this paintball gun, it comes in a reasonable price. It is compact, simple to understand and easy to carry pistol if you want to take it with you on your adventure games or out in the woods. It is easy to operate, and it is simple to understand the internal mechanisms of this gun because this gun requires to be cleaned up regularly so that its lifespan is increased. It has nine screws and a safety feature that is important to secure the weapon. The red sign indicates that it is unsafe and the black indicates that it is locked. The inside mechanism of the gun is not very complicated and the pump action of the gun makes it a unique model which delivers high speed and accuracy. This is yet another model by the same brand. It comes with a caliber of 0.68 and a barrel plug. It comes with two 12 grams CO2 tubes which are filled with 10 paintballs each. That makes it a total of 30 rounds for shooting right out of the box which is not available in many other paintball pistols. The paintballs and tubes that come with this model are sure a little less than the earlier one but it is ideal for those who want the same kind of internal mechanisms and design but in a lower price range. This model also features a special pump handle which is included in the brand name too. It is one the bets paintball pistols to buy because of its efficiency, accuracy and simple operation. All the other features of this gun are very similar to earlier reviewed model. This one also has a similar funky design and simple internal systems so that it becomes easy to clean it from time to time. Get in the game with the JT Splatmaster z100. Its real side action loads your ammo to get the most perfect shot. It comes equipped with a quick release magazine which holds 7 rounds of Ammo. It delivers a great accuracy’ up to 50 feet and can easily shoot over 100 feet. The whole package of the gun includes a reusable target for honing your skills, h=game play options and details, and a cocking help handle to make cocking easier for you. It offers you to make easy straight shots, provides quick action and lots of fun. It includes barrel plug, spring action firing and Marksman accuracy to 50 feet. It requires no batteries or CO2 and has a fire rating of .50 cal. For further details you may refer to the manual of the gun. 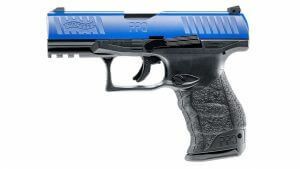 This paintball pistol is fully licensed by Walther Arms. It fires at the rate of .43 cal paintballs, dust balls and rubber balls. The trigger pull on this paintball pistol feels very much like double action trigger but internally it may be striker fired so you need to expect a longer trigger pull with a long rest and medium strength trigger weight. It has a realistic blowback and realistic dimensions. The build quality of this pistol is very god. It weighs about 1.87 pounds, or nearly 2 pounds. It comes with a polymer frame and helps to keep the weight of the gun down so you can combat easily. The fit and finish of the gun is brilliant too. This paintball pistol is a .43 caliber pistol and is the latest generation of high-end training and marking system used by military and other law enforcement forces for training purposes. 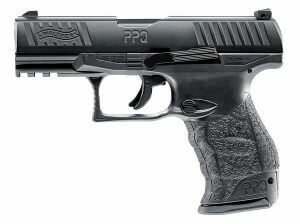 The design and handling of the gun is such that it is very similar to the Walther PPQ M2. It is powered by 12 grams CO2 cylinder fixed in the magazine of the gun. Each cylinder can be loaded up to 3 times which can hold 24 shots each. It comes with a pneumatic blowback system to shoot paintball, rubber balls and powder balls as well as pepper shot for self-defense. All these features qualify it as one of the best paintball pistols available today. This paintball pistol, last in our list, comes with a metal barrel and side. It has adjustable rear sight and fixed front sight. The polymer grip it is furnished makes it comfortable to hold. It is equipped with 8 round metal drop-free magazine with CO2 compartment and a .43 caliber which can take rubber balls and accept all .43 cal paintball Ammo. It is a very cost effective paintball trainer; fully licensed by Walther arms. It has a standard blue-black color combination. You may choose any one of the listed 8 popular models as your first purchase or look up for other quality paintball pistols online. Gathering more information is never a bad idea and you can refer to the manufacturer’s online websites to get more details.